What should Apple buy with its billions? A carrier. Apple has a lot of cash. As of Q2, 2011 Apple has over $654 billion dollars worth of cash reserves. This is uncharacteristically high for a company of Apple’s size and it has led to an enormous amount of speculation as to its intended purpose among tech pundits and fans alike. The only thing that’s for sure is that whatever it is, it won’t be small. Any carrier created or molded by Apple would surely be a data-only carrier. With the increasing viability of VOIP services like Skype and Google Voice, a traditional split-carrier model that handles voice and text messaging separate from a data system is not only antagonistic to the customer, it’s officially unnecessary. It’s incredibly amusing that Apple managed to sneak the entire foundation for a service that eliminates these problems into the iPhone right under AT&T’s nose with FaceTime. FaceTime’s design is centered around being able to make a connection regardless of firewall or data network and currently only uses a voice connection as a concession to AT&T.2 That initialization of the FaceTime call with a voice connection is key though, because it indicates that a FaceTime-to-standard-voice call should be possible. This would mimic Skype’s current ability to initiate calls to, as well as receive calls from, traditional voice carrier devices. In a stunning bit of slight-of-hand Apple has managed to cloak the obvious voice calling potential of Facetime inside the mask of a video chat service. Schmaltzy commercials about the emotional attachment that a video image brings notwithstanding, most of us are happy to communicate using just voice and FaceTime is completely capable of becoming the engine behind a Phone.app on an iPhone running on a data-only network. Apple has effectively tested the effectiveness of just such a communications protocol on millions of iOS devices by using video chat as a trojan horse. One of the most compelling reasons that Apple has to consider building its own carrier is the iPhone experience. I’ve written before about how removing the required connection to a computer would improve that experience. So would a simpler, friendlier carrier choice. Gone would be the need for the customer to have to consider all kinds of costly and confusing plans in order to own an iPhone. Instead they would have the ability to choose from three versions of the iPhone. One for Verizon, one for AT&T and one from AppleNet. The Verizon and AT&T versions would of course be subject to the same carrier plans, which would seem archaic and byzantine compared to the clean, easy to understand AppleNet plan. The price for an iPhone plan from AppleNet? $35 per month, unlimited. The pricing is relatively easy to divine. Currently the iPhone 16GB is sold at $599 in unsubsidized form. Because of the deals that Apple has in place with carriers, part of that cost is absorbed by the carriers and the customer only pays $199. That means that the carriers pay roughly $300 worth of your phones cost for you. But do they ever make it back. If you consider AT&T’s pricing for a basic plan with data at roughly $79 the carrier stands to make $650 worth of profit per 12 month usage period on each of its iPhone customers. Apple, by comparison, could afford to simply make what it already makes. That means, if you figure on an iPhone user purchasing 1 iPhone per year that costs Apple roughly $200 to make, that it would only need to charge $35 per month to make a full $599 on the 16GB model.3 Because any carrier that Apple creates would be functioning on a data-only model there would be no roaming concerns or other charges to cloud the issue. Regulatory taxes would most likely be added to this price. Although the math would apparently put Apple arrears on the 32GB model, if you consider that a price of $35 is actually slightly rounded up and that the increase in cost of NAND flash memory from 16GB to 32GB is perhaps $15, this would actually place Apple ahead on the higher capacity model. There is also certainly room for additional profit here as most people do not purchase an iPhone every year. This means that Apple would be collecting that $35 every month for an additional year or more on that device, adding several hundred dollars to the profit margin of each phone it sells. Apple has several possible options when it comes to creating its own carrier. One of the ones that has been discussed extensively is the possibility of a soft carrier, a way for smaller companies to lease chunks of network from the larger carriers to provide service. This won’t work for Apple for a variety of reasons, not to mention the fact that it wouldn’t be freeing itself from a relationship with the carriers at all by doing this. Leasing would mean that Apple would lose the pricing advantage, having to pay the carriers on top of charging enough to keep the iPhone profitable and in line with deals from the other major carriers. It would also mean that Apple would be beholden to future pricing changes and bandwidth restrictions. This doesn’t mean that you can completely rule it out though. There is a possibility that Apple could come up with an aggressive pricing structure that was based off of usage, which would be effectively zero when any iDevice was on a WiFi network, and pay the carriers a variable rate depending upon the amount of data used by iPhone owners. This would effectively hand off the 3G (or 4G) data connections to carriers like Verizon or AT&T while taking advantage of WiFi connections wherever possible. From a philosophical standpoint this doesn’t seem like a dramatic enough option for Apple. If it came down to creating an Apple-only carrier, its most likely moves would be to purchase an existing network or to build its own from scratch. Both options pose unique problems and costs that would be prohibitive without nearly $80 Billion in the bank. The only carrier option that’s really on the block for Apple now is Sprint. Its stock is down, making Sprint more affordable than ever, it has an extensive 3G network and a growing WiMAX 4G network in the shape of Clearwire. Currently Sprint is trading with a market cap of $16B and Clearwire, in which which Sprint owns a simple majority, is hovering at $5.5B. Apple would only have to spend roughly $22 Billion to scoop up both at once. This would give it an extensive 3G network and a solid, if not expansive, 4G network. Unfortunately this would also bring a lot of baggage with it. First of all, Sprint isn’t exactly the spryest of the major networks and, aside from its unlimited offerings, has been falling behind technologically and monetarily since the merger with Nextel in 2005. Of course, Apple then has to cast off the cruft of the prepaid divisions including Boost Mobile, Virgin Mobile and Assurance Wireless, not to mention the dozens of affiliate MVNO’s and the paleolithic iDEN PTT network. Apple would never migrate 46.1 million users, none of which are iPhone users, to its new service. There are too many hardware devices, too many variables and too many competing manufacturers that would be up in arms. Instead Apple would be likely to spin the data service off as its own product. This way Sprint would keep its doors open for its customers, it would be able to offer them its existing unlimited plans with a 4G connection leased from Apple. Essentially Apple would be cracking open the shell that is Sprint to get at the fleshy fruit of Clearwire and its 4G coverage. In the end I think that the biggest barrier that exists for a purchase of Sprint by Apple is the messy nature of its non-data networks. There is years of legacy technology at work here and a convoluted mess of voice services that Apple just isn’t interested in. If Apple does indeed go this route and purchase Sprint outright then it will be interesting to see how the network is carved up and which pieces Apple decides to keep for itself. The more exciting question is what happens if Apple decides to just go after the tasty fruit in the first place, buying Clearwire outright to build its own network from the ground up. What if Apple was to purchase Clearwire outright for $5.5B, thereby laying the groundwork for its own brand of WiMAX-based 4G coverage? 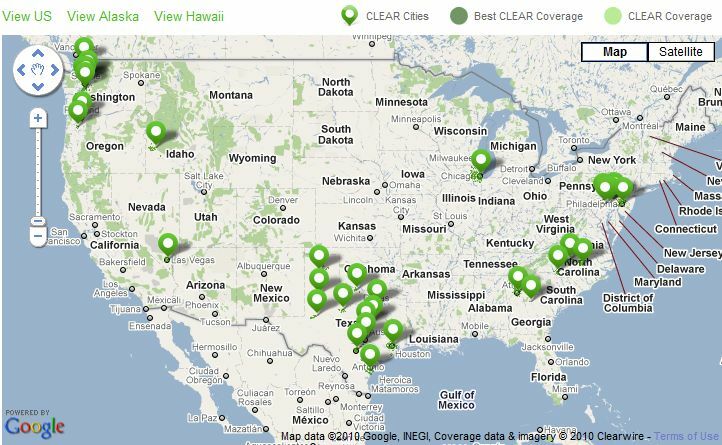 Clearwire has spent nearly $5B since 2009 building out its 4G coverage and it’s nowhere near done. Currently the network reaches in the ballpark of 120 million people. If Apple was to base AppleNet on WiMAX technology it could be expected to spend easily three times that continuing to build out coverage to reach a much larger percentage of the 300+ million residents of the US. Thankfully Apple has this kind of cash in spades. The biggest cost of building any modern wireless network isn’t the hardware of the towers or broadcast antennas themselves, not that they’re cheap, it’s the land rights to place those towers. If Apple wanted to build a truly game-changing data-only network and have that network be robust enough to challenge AT&T and Verizon in the next couple of years, it would need a significant boost in the amount of coverage offered by AppleNet. That boost could come from a place where millions of us get our boost every day. Starbucks. Apple could significantly expand this coverage by augmenting these Starbucks locations with WiMAX antennas powered by Clearwire. This could be accomplished by a partnership or long-term leasing arrangement that would allow Apple time to expand Clearwire’s network out to cover more area. The main reason that Clearwire has had difficulty expanding its coverage is lack of funds. Fortunately this is one problem that Apple doesn’t have. If Apple leveraged those funds to first use Starbucks locations as its own massive WiMAX hotspots, then build out the Clearwire network, it could have itself a data only carrier within a relatively short span. So a single model of iPhone, using data only, that works across all three carriers in the US: AT&T, Verizon and AppleNet. This is a dream scenario for consumers as it gives them the freedom to choose from any of the major carriers. But it’s not like this hasn’t been attempted before. The Retail Stores are Apple’s One Ring that will bind all of these possibilities together. Currently Apple has 236 stores in the US that sell millions of iPhones independent from the carrier stores. Apple could conceivably sell the AppleNet compatible iPhone from its Retail Stores and existing partners like Best Buy without breaking a sweat. These Retail Stores already drive the bulk of iPhone and iDevice sales and could continue to do so, becoming the primary distributor for devices running on AppleNet. The fact that additional devices, designed to run on the other major carriers, would be sold alongside them would just be icing on the cake. Apple having its own carrier would signify a significant leap forward for consumers when it comes to carrier parity. For the first time consumers that felt comfortable leading a data-only lifestyle would be able to migrate to the iPhone on AppleNet and those who for one reason or another feel more comfortable doing so, can remain on AT&T or Verizon. That is, until their contracts run out. This is just considering it from a present-day position as well. When (I don’t think anyone is still saying ‘if’) Apple announces its new iCloud service at WWDC in a couple of weeks we will get a better picture of how the cloud fits into Apple’s roadmap for the coming years. This could enable phones that could switch freely from one carrier to another with a set of over-the-air instructions, fulfilling prophecies of a carrier-agnostic SIM card. There are many things that Apple could spend the billions of dollars of cash reserves that its currently sitting on, but there are few things that could be bigger and bolder than a carrier designed from the ground up for its devices. A carrier that, if implemented properly, could give its customers the freedom that they’ve been looking for. 1Apple enthusiasts of old may remember this internal codename for AppleBus, one of Apple’s early forays into networking. A more apt choice would probably be Samwise as Apple Token Ring precedes AppleBus and was code named Frodo. 2The fact that FaceTime ‘requires’ a WiFi connection to work is also a concession to AT&T. FaceTime works perfectly fine over 3G connections using jailbroken iPhones or 3G hotspots. 4Note that $65B is a correction and includes marketable securities. I previously stated $77B cash.